Leather cleaning in the Los Angeles, CA area. What makes Chem-Dry stand out as a leather cleaner? We have made it our mission to be the experts in home cleaning – backed with decades of research and innovative tech. Chem-Dry leather products are not only safe for your furniture, but are also non-toxic and safe around you. We have been proven to be extremely effective at cleaning & restoring your leather furniture. We provide Los Angeles with leather couch cleaning, sofa cleaning, chair cleaning and other leather furniture items. Over the life of your leather couches & chairs you are sure to experience some of the common problems associated with all leather furniture. Our Chem-Dry Certified Technicians are trained to address these problems. Delta Chem-Dry has 60 stock pigment colors similar to the ones used in the tanning process to repair the inevitable scrape or scratch on protected leathers. We can also revitalize color on sensitive aniline leathers. A regular cleaning schedule including professional cleanings is recommended 1-2 times per year. In between professional cleanings, you can maintain the health and beauty of your leather furniture by cleaning with Chem-Dry Soft Cleaner® and rejuvenating the protection with Chem-Dry Protection Cream®. Both products are found in the Chem-Dry Home Leather Care Kit® available from Delta Chem-Dry. Call (310) 362-7818 for more information or schedule online today! We provide our professional leather cleaning & restoration services throughout the greater Los Angeles area. • What makes Chem-Dry stand out as a leather cleaner? 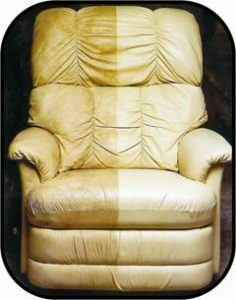 • What causes leather deterioration? • What can I do about scuffs, scratches, and fading? • How often should I clean my leather? A recommended cleaning schedule includes a professional cleaning 1-2 times per year.